The probiotics industry is poised for immense growth in India. Probiotics are functional foods that go beyond providing nutrition to the human body. While the use of probiotic drugs is widely accepted in India, intake of probiotics as a food supplement is yet to gain significance. People today are more informed and prefer to take the preventive path rather than adopting a curative approach. Given this approach, the future of the probiotic industry in India, which is still at a very nascent stage, looks promising. Probiotics are live microorganisms, which, if consumed in ample quantity, are said to be favourable to the host. Probiotics are mostly present in the form of bacteria, moulds and yeast, with bacteria being the most widely used. Probiotics can be consumed in the liquid state, as a powder, a gel, a paste, granules, capsules, sachets, etc. Live microorganisms improve intestinal microbial balance which spells better health and immunity. The global market for probiotic foods and drinks is pegged at $32.6 billion, with Europe and Asia contributing to 42 per cent and 30 per cent of the total revenues. The industry estimates suggest the growth of the industry at a CAGR of 12.6 per cent, with the increase said to be for a span of four years beginning 2009. Introduced in India in 2007, its current stature stands at $10 million with growth figures indicating an 8 to 10 per cent increase for the past 3-4 years. Munish Soni, Deputy General Manager, Marketing, Dairy Products Division, Mother Dairy, says, “The Indian probiotic industry is miniscule and at a very burgeoning stage. Currently, it stands at about Rs 50 crore and is growing at 20 per cent.” The Indian contribution to the world market for probiotics, however, is less than one per cent in terms of turnover. Probiotics are found mainly in milk and fermented milk products. This industry is stated for immense growth, considering the fact that India is the largest producer of milk across the globe and has the world’s highest cattle production. However, the potential of the probiotics category is yet to be realised fully. There are just a handful of brands operating in the segment and the product range is limited to curd, ice creams and milk-based drinks. The major players in the category are Nestle, Amul, Mother Dairy and Yakult. Amul introduced Prolife Probiotic Ice Cream and Sugar Free Prolife Probiotic Ice Cream in 2007, followed by Prolife Lassi in sachets and then in plastic cups. In 2011, it introduced Flaavyo Fruit Yoghurt, and this year, it has launched Flaavyo Frozen Yoghurt. The most important facet of Amul probiotic products is that the brand uses world class ingredients in terms of probiotic culture, milk, fruit/pulps, etc. Sold globally as a fermented milk drink, Yakult contains more than 6.5 billion beneficial bacteria (Lactobacillus casei strain Shirota) in a 65 ml bottle. Priced at Rs 10 for a bottle, these bacteria reach our intestine alive and impart various health benefits. 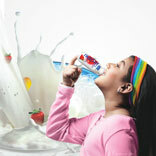 Mother Dairy offers Pro Activ Dahi and a drink. The price range commences at Rs 10 and their products also contain dietary fibre. The sale of probiotic products is limited to metros and some of the Tier I cities only. Rural areas are not on the list as the product calls for some concerns, which cannot be met at that level, the basic being refrigeration. Some areas do not even have access to electricity so it becomes impossible to offer shelf space to these products. “Yakult is available in all metros except Kolkata. We have made the product available in south India and in the next phase, we are targeting Tier II cities. As the category grows, our reach will also increase,” Sapra says. Yakult, which is bought 2-3 packs at a time, has the strongest sales in Delhi-NCR, taking into account that it is their oldest market. Probiotic products have a specific shelf life and need to reach the retailer and customer to be suitable for consumption. This calls for apt distribution and cold chain facilities for their transportation, which is a concern for this industry. Yakult has in-house cold chain management solutions and has its own trucks that transport the product at controlled temperatures of 10 degrees Celsius to retail locations. The Yakult ladies use red chiller boxes, which contain chiller packs that help control the product temperature. Mother Dairy is targeting kids for its probiotic products, as these products boost immunity. For the same, it has partnered with schools and introduced awards for those who have the best attendance. Also, it has on board dieticians, who prepare charts and activities for the kids. Mother Dairy also has a doctor engagement strategy that it follows to connect with the customers indirectly. Of the total curd business, probiotic curd contributes to about 7- 8 per cent. Amul is targeting youth and health conscious people and has promoted its probiotic range through press, hoardings and various BTL activities. To overcome the awareness hurdle in this industry, it has converted its chocobar into prolife ice cream. Sodhi says, “Anyone who wants to consume Amul Chocobar will consume probiotics and this is helping us to spread awareness about the benefits of probiotics.